These postcards from George Rogers Clark to his brothers, Edmund and William Clark, plus his sister, Lucy Clark, are just pretend. 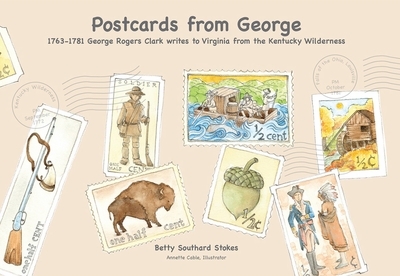 Postcards were not on the market during George Rogers Clark's lifetime. They did not appear until 1851, after George, Edmund, Lucy and William had passed away. Postcards evolved because people needed an easy way to send a quick note. A man named J.P. Carlton privately printed and copyrighted the first postcards in 1861. By 1870, a limited number of postcards appeared in publication in Europe. Most were published in Germany. The United States Postal Service began printing pre-stamped postcards called "Postal Mailing Cards" in 1873. Today, postcards are popular to mail to friends and family as vacation souvenirs. Betty Southard Stokes is a long-time educator, author and businesswoman in Louisville. She is the mother of two girls and she has an assortment of pets. A graduate of both the University of Kentucky and the University of Louisville, Betty spent 36 years as a teacher and administrator in public and private schools. Betty is still in the classroom with her own business, The One Room Schoolhouse. One of her favorite things to do is make history fun for children and help adults document their family history. She published Postcards from William in 2007. Special note: Arrington Wickliffe (one of Betty's great-grandfathers) fought alongside Jonathan and Edmund Clark, William Crogham, and Richard Clough Anderson. They all served with George Washington. Visit the One Room Schoolhouse's website by clicking here. Annette Cable is a freelance illustrator in Louisville, Kentucky. She has published twelve children's picture books including How to Be Full with Beauty, by John Hay, and Me On the Map, by Joan Sweeney. She lives with her husband Mark, her daughter Isabelle, three cats, two guinea pigs, and a dog. Annette grew up on a dairy farm in central Ohio with four younger brothers. She became an artist because she could play farm or cowboys and Indians only so many times! Her advice to young artists and readers is to draw and read, draw and read, draw and read, then draw and read some more. Visit her website at www.annettecable.com. Betty Southard Stokes's Postcards from William, published in 2007. The book is formatted the same as Postcards from George, and equally fun and educational.